Elvis is in the building—or at least his watch soon will be. 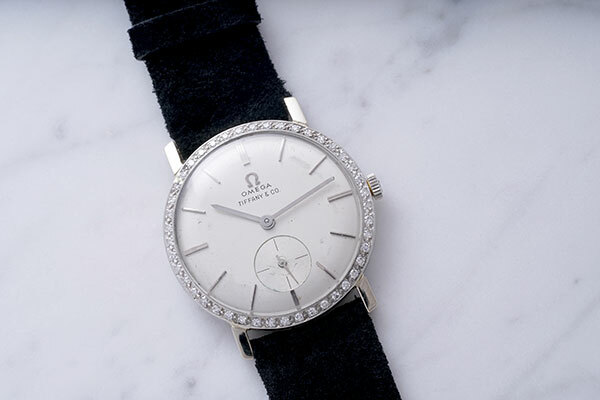 Auction house Phillips, in association with Bacs & Russo, announced today that it will auction an Omega wristwatch that once belonged to Elvis Presley as the highlight of its Geneva Watch Auction: Seven, scheduled for May 12–13 in Geneva. The watch was gifted to Presley in 1961 by RCA Records to commemorate the milestone of selling 75 million records worldwide. The music icon wore it briefly before trading it away. The singer’s record label, RCA, hosted a celebration charity event and concert on Feb. 25, 1961, “not only to award Elvis for such a significant achievement, but also to reestablish Elvis as a performer,” according to a press statement from Phillips. The Governor of Tennessee was a guest at the event, and even proclaimed the date “Elvis Presley Day,” before RCA presented Presley with a plaque commemorating 75 million records sold. The plaque is still hanging at Graceland, but the 18k white gold and diamond Omega wristwatch, which was purchased at Tiffany & Co., will soon have a new owner. But none has been attached to such a huge achievement and well-documented moment in time. 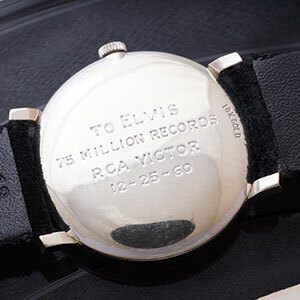 The timepiece is inscribed, “To Elvis, 75 Million Records, RCA Victor, 12-25-60.” It’s cased in 18k white gold, housing a manually wound Omega calibre 510 stamped with the “OXG” import code for the United States, along with the “Tiffany & Co.” retailer signature beneath “Omega” at 12 o’clock. The bezel is set with 44 round brilliant diamonds. The watch will be sold with certificates of authenticity from the Elvis Presley Museum and a book titled Elvis, by Dave Marsh, that includes images of Elvis Presley wearing this watch. The last celebrity-worn watch Phillips auctioned, Paul Newman’s Rolex Daytona, sold for an astounding $17.7 million in October. I don’t think this one will fetch anywhere near that (the so-called “Newman Rolex” is legendary), but it’s likely to bring in an impressive bid.